Michael Linnit and Michael Grade, the producers who brought Chess, Sunset Boulevard, Carousel and Sweeney Todd to the Coliseum are collaborating again with English National Opera to bring a brand new production of the multi-Tony award-winning Broadway musical, Man of La Mancha to the London Coliseum for a limited season with performances from 26 April to 8 June 2019. The press performance is on 30 April 2019. 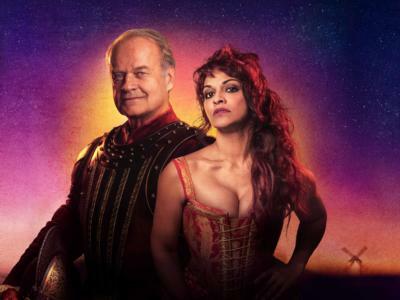 Emmy and Tony award winning actor Kelsey Grammer, best known for playing Dr Frasier Crane in NBC’s hit series’ Cheers and Frasier will make his West End debut playing Miguel de Cervantes and Don Quixote and the international opera star and soprano, Danielle de Niese will play Aldonza and Dulcinea. It will be directed by Lonny Price, who directed Linnit and Grade’s acclaimed London revival of Sunset Boulevard at the Coliseum starring Glenn Close, as well as its subsequent Broadway transfer. Inspired by Miguel de Cervantes’ seventeenth century classic, Don Quixote, and set during the Spanish Inquisition, the original 1965 production won five Tony Awards including Best Musical. With music by Mitch Leigh, lyrics by Joe Darion and book by Dale Wasserman, it tells the story of Cervantes who whilst in prison awaiting trial performs a play-within-a-play with his fellow prisoners. The play tells the story of the elderly Alonso Quijana, who renames himself Don Quixote and goes on a quest to right all the wrongs in the world. ‘The Impossible Dream’, one of the musical’s most famous songs has become a standard and has been performed by Frank Sinatra, Elvis Presley, Andy Williams, Luther Vandross and The Temptations amongst others. Kelsey Grammer played Dr Frasier Crane in Cheers and Frasier for two decades. He has won five Emmy Awards, three Golden Globe Awards and a Tony Award in 2010 for his performance in La Cages aux Folles. His most recent London performance was in The Big Fish at the Other Palace. Opera Soprano Danielle de Niese, described by the New York Times magazine as ‘opera’s coolest soprano’ has performed to audiences world-wide, from the Metropolitan Opera to Covent Garden as well as performing on stage with LL Cool J. Born in Melbourne, Australia to Sri Lankan parents, Danielle has been singing since the age of 8. Danielle has had starring roles in The Marriage of Figaro (in which she made her first appearance at the Met as Barbarina at the age of 19), Cosi fan Tutte, Orpheus and Eurydice, and more.